The former site of the Grand Cafe was located two doors over from the Grand Theatre. 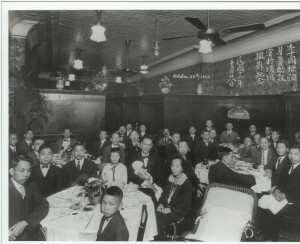 The Grand Cafe opened in 1916 and was Kingston’s largest Chinese-owned restaurant encompassing two floors. The restaurant was owned and operated by Mr. Peter Lee. In 1927 the Grand Cafe‚ advertised on the front cover of the Kingston City Directory, proclaiming its “Exclusive Service for Ladies and Gentlemen” with “Cuisine Unsurpassed”. This advertisement mentions the restaurant’s orchestra and alludes to the Grand Opera House (now known as the Grand Theatre), which was two doors down – indicating the class of customers they hoped to attract. 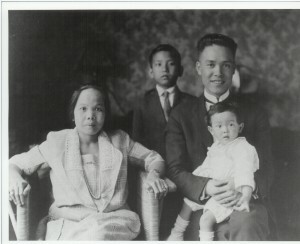 Mr. Lee and his wife were the proud parents of Victor Peter Lee, born on March 24th, 1923. 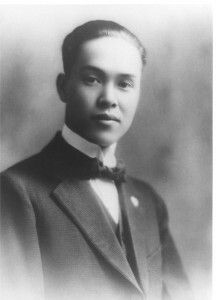 Victor was the first Chinese born in Kingston. This milestone was cause for celebration within the Chinese community as well as within the larger municipality. The British Daily Whig (the forerunner of what is now the Kingston Whig-Standard) published the news of the birth. The article detailed the event and emphasized the Lee family’s ties to the Sydenham Street Methodist Church. 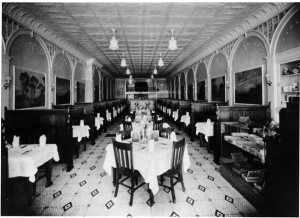 In 1938, the Grand Cafe became the Plaza Cafe and was managed by Paul Seto and Frank Shue. At this time the dining room offered modern soda-fountain service. It catered to Kingston’s student population. Students were able to dine while enjoying music from the Queen’s University Orchestra – the Tricolor Orchestra. Like most Chinese owned restaurants at the time, the Plaza Cafe‚ did not display any presence of its owner’s Chinese heritage. The decor was extremely modern. The only indication of Chinese culture in restaurants owned by Chinese immigrants was found in their menus, which offered a brief selection of hybrid Chinese-Canadian dishes. The Plaza Cafe closed its doors in 1960 after over 44 years on Princess Street.